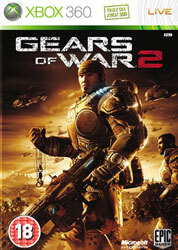 At the risk of making this entry sound negative, even if Gears 2 improved on the original in pretty much every way, I just didn’t like it as much. It looks staggering at times, the vehicle sections were actually far from being atrocious this time, and Horde mode is a work of genius. But the lull in the fourth act and a multiplayer mode that just didn’t do it for me after a year of Call of Duty 4 and Halo 3 means it doesn’t quite hit those heights. Like I said, though, I didn’t dislike it at all. When it’s on song and you’re playing on the right difficulty the combat in this game is second to none, as visceral and thrilling to play as you could hope for. Enemies are just intelligent enough to keep you on your toes while still being possible to take down with some clever teamwork or led into a trap, and while some of them annoy on higher difficulties, there’s enough variety to them to bring distinct tactics into the mix. There I go, sounding all negative again, but constructive criticism is what will make the next one the revelation that the first game was rather than the impressive but safe sequel that this game turned out to be. Make sure to keep Horde mode next time, though. It’s awesome.